Have y'all met my pal Domestic Spaz? Can I just say, she is so cool. Last week the two of us were talking about the vastness of the blogosphere. There are just so many blogs. Of course, there are "the big blogs" -- the blogs we all have in our feed readers. But for those of us with only a handful of subscribers, as opposed to hundreds, it's sometimes hard to shake the feeling that you're a very small fish in a very large pond. So, you know what Spaz goes and does? She creates an award. For the little fish. She is one smart (not to mention inclusive) cookie. 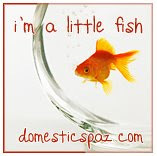 Each week she has decided to feature a "little fish" blog -- one you don't find all over other people's blogrolls. I'm so honored -- I don't know what to say! The Little Fish Society is a club that I am more than proud to join, my friend! Thanks so much for the terrific acknowledgement. So, what "little fish" blogs do you read? What "lesser known" blogs continually have you coming back for more or crack you up with their content? Leave a comment and let me know, or even better, head over and let Spaz know. Because she wants to award the Little Fish to blogs recommended by y'all. See. I told you she was cool. Hey, congrats! I love this idea! Hey, love that idea. Congrats! This is a great idea. And I have often thought about the big fish vs. us little ones. I used to want to be a big fish...although I would have never said so out loud! Now, I am not so sure. I want to be able to dialog back and forth with people who are regular on my like (like you) by responding with comments and emails...but that would be so hard with numbers in the 100's! Don't ya think? With that said, Here's to the Little Fish! What a great idea! You are well deserving of this, by the way. Congratulations. Personally, I print some myself on a color injet printer, or print them at the local supermarket. If I need it bigger than 8x8 or for a special occasion, or am printing out lots of copies (baby announcements, family christmas cards etc) I find the local printer in our town is very competitive and provides an excellent service. As I now have a small work-at-home business digi-scrapping for others, I nearly always use the local printer. My fav thing to do with my layouts is to make mini-albums, and these are really easy/cheap to print out as you can get lots on one page. What a lovely idea!! I have what feels like a few million little fish in my blogreader! !